Douglas Gordon: 24 Hour Psycho, 1993. Photo: courtesy of the artist and Hirshhorn Museum and Sculpture Garden, Smithsonian Institution, Washington. Photographer: Christopher Smith. Film stills from Psycho, 1960. Director: Alfred Hitchcock. It is hard to imagine that only 30 years ago John Szarkowski’s presentation of William Eggleston’s photographs at the Museum of Modern Art could be considered a breakthrough because they were in colour. By separating lens-based imagery from the 19th century notion of fine art to which the black and white photograph had been, up to that point, confined, MOMA – a key player in the creation of the very idea of modern art – expanded the definition of art to include contemporary production, opening the door to, among other things, works in new media. Arguably it is this event, rather than say work done in structural film, that augured the current dominance of video installation in contemporary art: It points to the growing importance of the institution itself. This is especially true of work on video. If Duchamp had critiqued the artwork’s institutional dependence a prescient 90 odd years before, the triumph of video installation as an art form represents its wholesale consolidation; the two cannot be separated. Functioning as a companion piece to, and update of, the Whitney Museum’s 2002 exhibition about the projected image “Into the light: Image in American art 1964-1977”, Beyond Cinema presents 27 works designated as markers along the road to video’s present supremacy. The focus of both shows is the art form’s basic technical requirement of projection as a stepping off point for the creation of a spatial experience in the gallery, whether perceptual or psychological and usually a combination of the two. Video’s ability to be projected from the rear, as opposed to film’s frontal orientation, adds an extra dimension to this dynamic. The exhibition does an excellent job of showing the different ways that artists have devised to think through the permutations of this possibility. Edge of a Wood (1999) a ravishing installation by Rodney Graham opens the show, and suggests its emphasis. While early video art was once valued for its anti-aesthetic austerity, Graham’s work has a shimmering painterly lushness. On a two-screen projection, helicopter-mounted searchlights illuminate trees at the edge of the forest to the deafening sound of the chopper’s blades. With this simple but gorgeous update on the genre of landscape painting, Graham implies that art may change in keeping with technological developments but its focus stays the same: the world and the complicated business of how we see it. Graham’s work creates a threshold for the viewer’s entry into the exhibition – this is especially true due to the enveloping nature of its soundtrack ¬– suggesting that the prevalence of video projection in art is only a reflection of the immersion of our culture in a mediated world. Douglas Gordon’s 24-hour Psycho (1993), is well-served in this context. The artist’s slowing down of Hitchcock’s film to a molasses pace looks today less like a neat trick than a statement of millennial significance: The dream – and the nightmare – of our mediated lives has no beginning or end. 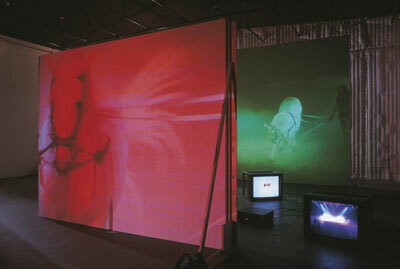 Diana Thater: The best space is the deep space, 1998. Courtesy of the MAK Center for Art and Architecture, Los Angeles, California, USA. Photographer: Fredrik Nilsen. encapsulates this idea in a dazzling four-part installation. An image of a white horse and her handlers standing in a ring is seen through the haze of dry ice and a changing array of colored spotlights. Variations of this scene are repeated in two large screen projections and on a monitor placed on the floor: viewers see what the cameras see and see the crew filming this in a shot from behind their backs. As the colored gels change from pink, to yellow to blue, the horse appears and disappears, and on another monitor, alphabet fridge magnets in primary colours spell out the production credits against a white background. The installation acts like an object lesson in the persuasive authority of the image. For all of Thater’s efforts’ to break down the illusion, its powers of mystification remain no less profound. Another stunning work, Monica Bonvicini’s Destroy She Said (1998), uses repetition and dissonance to fracture the space of filmic artifice. On an angled two-screen projection with the wooden grid of its support sticking out on all sides, the artist presents clips of European film stars, such as Anna Karenna and Monica Vitti, in a variety of fraught cinematic moments. On the audio track we hear a women crying, a phone ringing, a plane traveling overhead, the sounds sometimes in sync with the image but mostly not. When in this montage of distress, a woman shoots a gun, the repertoire of dramatic effects is complete, the artist suggesting that, at least as far as cinema is concerned, the psychological space of femininity is dangerously overwrought. Toronto artist John Massey’s seminal As the Hammer Strikes (A Partial Illustration) (1982) offers a kind of masculine counterpart to Bonvicini’s work. A three-channel installation in black and white and color, the artist drives a car on the highway in the desolate Canadian winter. As he converses with a hitchhiker he has picked-up, the screens alternate between images of the landscape, the driver and his passenger, and stock footage shots of the things they talk about. Because the hitchhiker speaks with a slight stutter, the conversation is somewhat stilted, and this impression is reinforced by the image montage. When the passenger talks about being at a strip bar and we simultaneously see the image of a stripper on an adjacent screen, it creates a strangely hollow feeling, as if the speaker had no interiority. A little seen example of video projection in its early form, as a critique of mediated subjectivity the work is devastatingly effective. For Canadians, Beyond Cinema is a watershed for two reasons. Amongst a curatorial team of four, two are from Canada, the artist Stan Douglas and Christopher Eamon, curator of the San Francisco-based Kramlich collection, one of the largest and most important private collections of media art. The duo’s involvement and the strong presence of Canadian artists in the show attests to the leading role Canadians have played in the development of this art form (Douglas’ is represented in the show with his magnificent 1986 work Overture.) A crucial acknowledgement of this contribution, The Art of Projection may also represent a turning point in Canada’s ability – or willingness – to sponsor its artists internationally. Beginning April 1st, 2007, the Harper government has allotted a budget of exactly zero dollars to its missions abroad for the promotion of Canadian culture. This from a Federal government that the Oct 25th Globe and Mail reported was “awash in surplus cash.” Although in Quebec there has been considerable uproar about this disturbing shift in cultural policy, it appears to have gone relatively unnoticed in English Canada. Now is the time is for everyone involved in the arts in Canada to work to reverse this trend. There is more at stake here than the careers of Canadian cultural producers abroad. It is not much of an exaggeration to say that a government so unaccountably hostile to the arts portends a dark future for the country. Fassbinder: “Berlin Alexanderplatz - An Exhibition,” 2007. 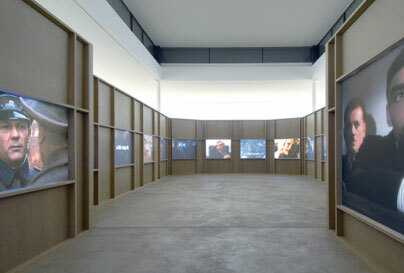 View of the exhibition at KW, Berlin. Photo: Uwe Walter. Writing about Berlin Alexanderplatz in 1983 when Reiner Werner Fassbinder’s 14 1/2 hour film epic was first shown in the US, the New York Times’ film critic Vincent Canby noted that the – at that time – recent appearance of home video rental offered a way to negotiate the film’s unfeasible length, and also possibly presaged the creation of a new art form. Canby was right about this, but in a way that he could not have anticipated. The idea that video rentals could democratize and decentralize artworks, putting control into viewer’s hands has been borne out in spectacular fashion by the online video site YouTube, which invented not only new conditions for viewing but an entire universe of viewer-created content. The question of whether the short videos that can be seen on YouTube can be considered art is entirely germane to Klaus Bisenbeck’s presentation of Berlin Alexanderplatz at the Kunst Werker in Berlin. A major force at the KW since its inception, and now also a curator at PS1 in New York, Bisenbeck is a controversial figure in the Berlin art world. This exhibition will do nothing to alter that reputation. All credit should be given to him for the scale of vision he brings to the staging of Fassbinder’s film. Although revered internationally, the German attitude to the director continues to be ambivalent. As a friend of mine said Fassbinder was “too gay, too political and took too many drugs” to really be a welcome addition to the pantheon of great German artists. Recognition of Bisenbeck’s achievement, however, can’t avoid mention of the obvious caveat about the way this exhibition reduces the conditions for viewing the work to the diminished scale of a contemporary audiences’ YouTube-like attention spans. Originally made for German television in 1980, the film’s 13 episodes plus an epilogue, which have been re-mastered for 35mm, are shown as loops in 14 separate viewing booths. The film is also screened in its entirety in a small adjacent room outfitted with cinema-style seating. While this is intended to provide a context for the liberties the KW takes in presenting the film as an art installation, the intact screening of the film also makes the weaknesses of the latter strategy apparent. Perhaps this was intentional too? Certainly the exhibition is successful in staging a dialogue between the two formats of viewing. In contrast to the strong narrative pull one experiences when the film is seen as a whole, the installation caters to a more distracted form of reception. Temporarily constructed for the show, the 14 connected booths snake around the perimeter of the KW’s ground floor exhibition space, the last booth functioning like an exit into a central atrium-like area where the obverse screen of all the projections can be seen simultaneously. The effect is spectacular, the coherence of Fassbinder’s vision being blown apart into competing disjunctive fragments. The claim of the show’s press release is that presenting the film in this way allows the viewer to decide “how they want to approach it”. The assertion ignores the fact that viewers’ have always been able to decide how they approach an art exhibition, but the KW is merely speaking in lingua franca of the contemporary art world when it emphasizes the viewer’s ability to participate in an exhibition as one of its main attributes. As English literary theorist Terry Eagleton notes, the current culture’s preoccupation with audience interactivity originates in reception theory’s insight that, “readers were quite as vital to the existence of writing as authors.”1. Reception theory gave the world the idea that readers and viewers have an active role to play in the creation of meaning, but the question remains: What meaning can result from presenting Fassbinder’s film in this way? Fragmenting the German director’s massive cinematic accomplishment into bite-sized pieces would seem to play to our culture’s worst atomizing tendencies. Take the time to watch an episode from beginning to end, sitting in a viewing booth on one of the cushions provided, and your patience will be rewarded; Fassbinder’s greatness as a director ensures that. Presented with so much choice, however (leaving aside the possibility of watching each episode in full, laboriously going from booth to booth in chronological order to undermine the show’s premise) the urge is to flit around and sample the film, suggesting that the point is to experience its ambience rather than meaningfully engage with its content. View the work as a momentary series of encounters, and the static quality of Fassbinder’s dramaturgy becomes apparent — but then he never was a director interested in naturalism. Enter a random choice of rooms in quick succession and you get the impression that all of Berlin Alexanderplatz takes place while the characters sit around talking to each other in one bar or another. The presentation makes the film’s typological connection with the genre of the soap opera apparent. Regardless, viewing the film in this way also gives it the fascinating quality of a parallel universe. Each screen is like a window proving a figurative glimpse into Berlin’s past, a world comprised of the extraordinary history of the city and the artworks and literature it has inspired. 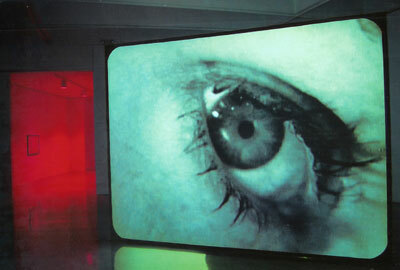 The precedent for Bisenbeck’s show is Scottish artist Douglas Gordon’s 24 Hour Psycho (1993). Gordon’s premise was that presenting Hitchcock’s famous film as an installation (slowing the projection down to a speed of 24 frames per minute) would reveal the film’s unconscious: the ulterior world it created beyond any of individual element of the director’s intention. Considered from this angle, Bisenbeck’s installation works exceptionally well; he compounds the brilliance of Fassbinder’s work by abstracting it. In the process, the prismatic reality he created is made apparent, not only in this film but in Fassbinder’s body of work as a whole. 1. After Theory, Terry Eagleton, Penguin Books, London, 2003. p. 53. You are currently browsing entries tagged with Douglas Gordon at Army of YouTube.